What Every BODY is Saying is one of the most popular books on nonverbal communication and it’s easy to see why. Actually, it’s the book on reading body language. It’s been queued up in my Kindle for a while and I finally got around to reading it. The technical term for body language is nonverbal communication and it’s a topic I’ve been interested in for a while. Before reading it I had a grasp of the nonverbal basics but the book will take you to the next level. 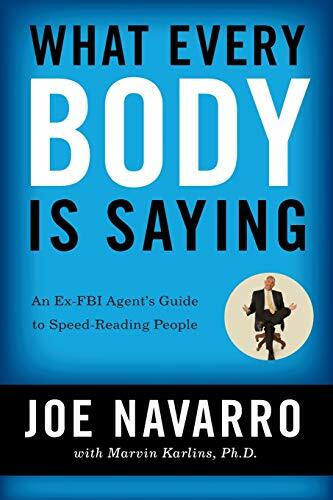 It’s written by Joe Navarro, an ex-FBI agent who spent his entire professional life studying and applying the science of nonverbal communication. Born in Cuba, he moved to the US when he was 8-years-old and didn’t speak English. The key point Navarro makes throughout the book is that people provide ‘tells’ in their nonverbal communication. A tell doesn’t mean someone is lying but it shows that they’re uncomfortable. What Every BODY is Saying is not a book that is about how to spot a liar (although it could). Instead it shows you how to identify when people show signs of discomfort when their words are saying something different. It also provides information on how you can communicate nonverbally in a more positive way. We’re all guilty of showing bad posture or closing ourselves off in certain situations. The human body is capable of giving off thousands of nonverbal signals and messages. The overarching theme of the book is that nonverbal communication is evolutionary. We have been pre-programmed through years of evolution to have an automatic reaction to certain situations. These reactions are carried out by the limbic system part of the brain or the ‘honest brain’ according to Navarro. Honest because it’s the automatic response that we have no control over. He says the limbic brain is the holy grail of body language. The neocortex part of the brain is the “lying brain” because it’s the intellectual part of the brain which has helped human thrive and also lie. Understanding nonverbal communication requires knowing how to read facial expressions, gestures, physical movements, body distance, touching, posture and even clothing. The book outlines how to do this chapter by chapter. What’s more, according to the book, nonverbal communication comprises approximately 60 to 65 percent of all interpersonal communication. In other words, we communicate more nonverbally than we do verbally. In other words, if you can’t read nonverbal communication you receive less than half of the information presented. Nonverbals have been with us for a very long time. It’s the primary means by which we communicate. From the moment we’re born we communicate that we’re cold, hot, hungry and so on. Even as we get older it’s still the primary method which we select our mates. How we communicate feelings like love and empathy. We use it to detect danger and to know when someone is lying to us. Navarro cites the 1960’s presidential debate as an important moment for nonverbal communication. It was the first time a presidential debate was aired on TV as well as radio. Afterwards, the polls found that those listening to it on the radio thought Nixon won and those watching TV thought Kennedy did. What are the benefits of understanding nonverbal communication? Navarro says that the ‘fight or flight response is wrong. There’s a ‘freeze’ element to it as well. For example, think of a rabbit caught in a car’s head lights. It freezes. There’s no flight or fight. The limbic brain controls the fight, flight and freeze responses and they are important to understand when reading the book and he breaks people’s limbic brain responses into these three areas. Freeze response: When people feel threatened sometimes they freeze. If someone’s asked questions that make them uncomfortable they might interlock their legs around the chair legs and hold that position tight. Flight response: The same person may distance himself by leaning away, placing objects on his lap or turning his feet away to the nearest exit. Fight response: It may not be physical aggression but when feeling challenged the respondent may create an argument which is a fight by non-physical means. Learning to recognise and decode ‘pacifying behaviour’ is critical to reading nonverbal communication. Pacifying behaviours reveal with uncanny accuracy a lot about the person’s current state of mind. What’s a pacifying behaviour? They take many forms and it’s where our limbic brain tells us to comfort a part of our body when we’re feeling stressed. Touching the neck, rubbing the forehead and playing with hair are all pacifying behaviours and each one communicates a different meaning. Rubbing of the forehead is usually a good indicator that a person is struggling with something or is undergoing slight to severe discomfort. Neck touching takes place when there is emotional discomfort, doubt, or insecurity. On the left, the knee is further away and barriers have been removed. On the right, the knee acts a barrier. In another nod to evolution, Navarro says because the torso houses vital organs, such as the heart, lungs, liver and digestive system, the limbic brain seeks to protect this area when threatened. Folding your arms during a heated conversation is an example of this. Arms are also controlled by the limbic brain. Consider when something is thrown at you, the natural response is to raise your arms. Or when your team scores your response along with your fellow supporters is to raise your arms. On the flipside, when you hear bad news the arms usually slouch. Spreading your arms wide over a counter of desk is a territorial display of confidence and authority. Likewise arms akimbo is a powerful territorial display that can be used to establish dominance or to communicate that there are issues. Hand steepling is one of the most high-confidence tells according to Navarro. Steepling signifies that you are confident about yourself, your thoughts and your position. Steepling is so effective Navarro says it, “can be such a powerful purveyor of confidence and self-assurance that it is hard to challenge a person displaying such a nonverbal signal.” On the flipside, hand wringing is a way of showing we are concerned about something. When it comes to emotions Navarro says “our face is the mind’s canvas.” We communicate nonverbally through a smile, a frown and everything between both expressions. He says humans have around ten thousand different facial expressions. Our faces can be an honest representation of how we feel but since we can control these expressions to a degree this is not always the case. Every BODY is Saying by Joe Navarro is a book full of practical advice. Applying what is outlined in it will help you develop the skill to read nonverbal communication on other people and use it in your own personal communication. How we communicate goes way beyond what we say. The body and face are a trove of subliminal messages that can go undetected if you don’t know what to look for. The book helps you identify this language and breaks it down per body part. Our feet, legs, torso, arms, hands and face all give away clues to what we really think and feel about given situation. The book provides a blueprint in how to read them. To get the most out of the book and Navarro’s decades of studying and applying nonverbal communication requires effort. Read it a couple of times, take notes and, most important, go out into the world and apply it yourself. Once you start identifying tells on other people you will begin seeing things a little different than before. In fact, you may never see a situation the same again.